What is a STEAM Night? Up to two hours of programming, including 5 different activities showing the integrated learning that occurs through STEAM (Science, Technology, Engineering, Arts, Math). Email [email protected] with your choices and an estimate of the number of attendees and grade level(s). Identify at least 10 volunteers to facilitate activities. Volunteers should report 30 minutes early. Each activity needs at least one table. Arrange for a location. We have worked in school gyms, cafeterias, hallways, and classrooms. Invite families! This fillable PDF FLYER is free to use. Microscopy (S-T): Use digital microscopes to take a look at seasonal objects from nature. Electricity and Electromagnets (S-E): Construct an electromagnet from simple materials and experiment with simple circuits. Galaxy Dough (S-A): Hands-on sculpting activity with sparkly dough the color of deep space. 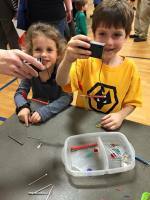 Inventing with Electronics using littleBits (S-T-E): Invent something with magnetic circuit kits. Marshmallow Engineering (E-A-M): What can you build with simple engineering materials? Lego Challenge (E-A-M): Use color, size, and pattern guidelines to build a lego tower. Best for grades K-3. Catapults (S-T-E): Use sticks and rubber bands to launch a projectile. 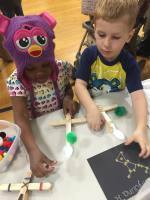 Circle Art (A-M): Experience the geometry of circles using a variety of tools and art materials. 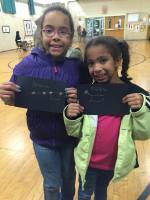 Constellations (S-A): Create a constellation art piece. Seasonal Symmetry (S-A-M): Study symmetrical images from nature and make symmetrical art. Honeycomb Collaboration (S-A-M): Explore the structure of honeycombs in this community building project. Ozobots (S-T-E-A): These little robots respond to a color-coded language that kids can draw. Binary Code Bracelets (T-A-M): Use binary code to make a bracelet that represents your intials. Plasma Globe (S-T-A): Lightning, Neon, Northern Lights? Investigating the fourth state of matter. Surface Tension (S-M): How many drops of water will fit on a penny? A quarter? BUZZ about Coding (S-T-E-M): Explore the basics of robotics and coding with Bee-Bot! Best for grades PreK-3. Refractometry (S-T-M): Measure plant juices to determine the sugar ratio of the plant, and how it might be used as a biofuel. Weight & Balance (S-T-M): Predict and experiment with two-pan balances and a variety of objects. Dry Ice Bubble Fun (S-T-A): Bubbles are cool, but bubbles filled with fog are even cooler. Roll them, bounce and pop them to release the burst of fog. Apple Jenga: (S-T-E-M): Explore with flat blocks and cubes to build the tallest tower that will support an apple. Arch Engineering (S-T-E-A-M): Are arches just “artsy” or do they actually make a bridge stronger? Domino Diving Board (S-T-E-M): How can engineers help us “hang out” safely? Thrill Seekers (S-T-E-A-M): Can you engineer a good roller coaster design? Against the Wind (S-T-E-A-M): How can engineers save energy through design? Marble Maze (S-T-E-A-M): Create a paper plate marble maze game inspired by pinball machines using just a few common craft supplies and a marble. Smelly Balloons (S-M): Can you detect the hidden scent? Tiny molecules are too small to see, but sometimes we can smell them. STEAM Boat Challenge (S-T-E-A-M): How much of a load can your boat hold? Imagine, plan, create and test your boat made from aluminum foil. No Hands Cup Stacking Challenge (S-E-M): This hands-on group challenge is an exercise in patience and perseverance, not to mention a total blast! ​*NEW* Sport Science Activities presented by The Siddiqi Foundation : Choose an all sport science theme or mix and match with our other Family STEAM event activities! ​How Drugs and Alcohol Affect Your Abilitiy: Using vision impaired goggles, you can experience the disorienting sensation of drugs and alcohol. With your vision impaired, try your hand at a beginner sports skill. Cardio Comparisons: Aerobic exercise is movement that gets your blood pumping faster around your whole body. It makes your heart beat faster too. It also makes your lungs take in more oxygen. This causes you to breathe faster during the exercise. Aerobic exercise is important for kids. Test your heart rate and oxygen level before and after exercising. How Quickly Can You React? : Has anyone ever said, "Think fast!" and then thrown a ball at you? How quickly or slowly you react is called the reaction time. Take the Falling Ruler Test and learn how to get faster. Making Healthy Food Choices: Food and drinks that are high in added sugars have extra calories and may have few nutrients. Too many sugary foods and sweet drinks can make children feel full and leaves less room for healthy foods. Too much sugar can also lead to cavities if children do not brush their teeth regularly. Test your favorite drinks to uncover hidden sugar! Hands-Only CPR: Practice Hands Only CPR while listening to any number of popular songs including “Rumor Has It” by Adele and “Stayin’ Alive” by the Bee Gees. It takes less than a minute to learn how to save a life. What is Peripheral Vision? : Peripheral vision is important in our everyday lives because it allows us to gather a visual sense of our surroundings—without it, we would see the world through "tunnel vision." Almost everything we do—from riding a bike, to dribbling a basketball, to reading a book—depends on peripheral vision. Test the limits of your peripheral vision now! Mobile Planetarium - Add $300. Up to abbreviated demonstrations in 2 hrs and up to 45 people per demonstration. Extra Muse staff - Varies. Please call at least one month in advance if you are unable to provide sufficient volunteer volunteers. 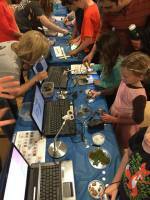 Check out some great moments from our STEAM Nights!